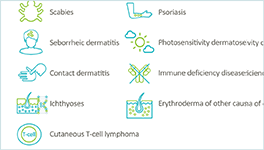 Welcome to this highly-visual, interactive module on atopic dermatitis (AD). The module will increase your understanding about the pathophysiology of AD, recently approved and emerging therapies, and their unique mechanisms of action. Ultimately, you will be armed with information to make better treatment choices to positively impact the management of your patients with AD. If you are requesting AMA PRA Category 1 Credits™ or a certificate of participation—your CME/CE certificate will be available for download. This activity is intended for dermatologists, primary care physicians (including pediatricians, family physicians and internal medicine), nurse practitioners, and physician assistants. In order to safely and appropriately select from among a wide range of emerging new therapies, dermatologists, primary care physicians and other health care practitioners must be able to understand key aspects of AD pathophysiology/immunology, how these factors relate to the mechanisms of action (MOA), and agent-specific characteristics and data. They must gain the ability to apply this new information in day-to-day practice, making selections (or referring for specialist management) based on these facts together with the individual patient’s particular characteristics. The France Foundation designates this enduring activity for a maximum of 0.50 AMA PRA Category 1 Credit(s)™. Physicians should claim only the credit commensurate with the extent of their participation in the activity. Successful completion of this CME activity, which includes participation in the evaluation component, enables the participant to earn up to 0.50 Medical Knowledge MOC points in the American Board of Internal Medicine's (ABIM) Maintenance of Certification (MOC) program. Participants will earn MOC points equivalent to the amount of CME credits claimed for the activity. It is the CME activity provider's responsibility to submit participant completion information to ACCME for the purpose of granting ABIM MOC credit. Nurses who are certified by the American Nurses Credentialing Center (ANCC) may utilize activities that are certified by ACCME-accredited providers toward their requirement for certification renewal by the ANCC. A certificate of attendance will be provided by The France Foundation, an ACCME accredited provider. In accordance with the ACCME Standards for Commercial Support, The France Foundation requires that individuals in a position to control the content of an educational activity disclose all relevant financial relationships with any commercial interest. TFF resolves all conflicts of interest to ensure independence, objectivity, balance, and scientific rigor in all its educational programs. Furthermore, TFF seeks to verify that all scientific research referred to, reported, or used in a CME/CE activity conforms to the generally accepted standards of experimental design, data collection, and analysis. TFF is committed to providing learners with high-quality CME/CE activities that promote improvements in health care and not those of a commercial interest. Louis Kuritzky, MD, has served as a consultant for Amgen, Allergen, Boehringer Ingelheim, Lilly, Lundbeck, Novo Nordisk, Sanofi and Shire. He has served on the speakers bureau for Amgen. Jonathan Silverberg, MD, has served as a consultant for Abbvie, Eli Lilly, Galderman, GlaxoSmithKline, Kiniksa, Menlo, Pfizer, Regeneron-Sanofi, Realm, and Roivant. He has served on the speakers bureau for Regeneron-Sanofi. Dr. Silverberg has received contract research from GlaxoSmithKline. Theodore Bruno, MD, FACEHP, and his spouse are shareholders in Allergen and have received financial support from Allergen.